Fine Gael’s attack strategy has also brought about a collapse in support for that party’s candidate, Gay Mitchell, who is polling at just 9% in the polls, or about half Mr McGuinness’s rating. A spate of outlandish and over-the-top reactionary invective began on Sunday when self-styled Fine Gael ‘hitman’ Phil Hogan described Mr Mr McGuinness as a “terrorist”. Environment minister Hogan claimed US multinationals would be “appalled” if the 26 County state elected Mr McGuinness as its head, and would ruin the reputation of the 26 County state. Mr McGuinness quickly rejected the claims. “Phil Hogan wants to catch himself on. It shows how little he knows about the north and how little he knows about my working relationship with unionist politicians,” he said. The abuse continued through two election debates, with the normally anodyne Fine Gael candidate Gay Mitchell suddenly launching into bizarre and confused tirades against Mr McGuinness, Sinn Fein, the IRA and republicanism in general. It later saw him accused of being involved in the Northern bank heist in an internet posting by the Fine Gael chief whip. Public reaction to the strategy has been decisive, with a dramatic collapse in support for the struggling Mitchell campaign. Mr McGuinness now finds himself and his party backed by of one in five of the 26-County population, within striking distance of the Presidency and the undisputed leaders of the opposition in the Dublin parliament. The disastrous change of tack by Fine Gael was reportedly motivated by fears within the party’s leadership that the campaign had failed to motivate its ‘traditional’ support. Urged by the extremem right-wing Independent News and Media group to vocally reassert its historical opposition to republicanism in all its forms -- described by veteran reactionary Eoghan Harris as the reason why Fine Gael exists -- the party’s desperate bid to salvage its campaign by emphasising its ‘Blueshirt’ (anti-republican) credentials, dating from Ireland’s civil war, has backfired in the most spectacular fashion. Another beneficiary of the Fine Gael collapse has been County Louth businessman Sean Gallagher, a member of Fianna Fail’s executive up to last year, who is now running as an independent candidate. Gallagher gained fame on Ireland’s version of a popular British reality TV show, and his rhetoric on jobs creation has been well received by conservative voters. But the latest poll results make for encouraging reading for the Sinn Fein supporters. The party has leapfrogged both Labour and Fianna Fail, and is now the second most popular party in the 26 Counties, according to the latest MRBI poll. When people were asked who they would vote for if a general election were to be held tomorrow, the figures for party support compared with the last such poll on July 20th were: Fine Gael, 35 per cent (down three points); Sinn Fein, 18 per cent (up eight points); Labour, 17 per cent (down one point); Fianna Fail, 16 per cent (down two points); Green Party, 2 per cent (no change); and Independents/Others, 12 per cent (down two points). When people were asked who they would vote for if the presidential election was held tomorrow, the figures were: Michael D Higgins 23 per cent; Sean Gallagher 20 per cent; Martin McGuinness 19 per cent; Mary Davis 12 per cent; David Norris 11 per cent; Gay Mitchell 9 per cent; and Dana Rosemary Scallon 6 per cent. The former frontrunner Senator David Norris has seen his support more than cut in half in the recent poll. The shift came about when questions about his past actions in defence of child abusers were finally raised by the mainstream media, and failed to elicit clear answers from Norris. New revelations over his receipt of ‘disability payments’ while serving as a Senator for 16 years are likely to further hamper his campaign. 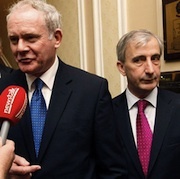 During a heated and widely-watched presidential debate on the privately-owned TV3 channel on Tuesday evening, host Vincent Browne also launched into a dramatic attack on Mr McGuinness’s statement that he left the IRA decades ago. With the six other presidential candidates looking on, Mr Browne produced several books claiming Mr McGuinness had been a senior figure in the IRA in the recent past. Mr McGuinness told the Bloody Sunday Inquiry he had been an commander in Derry at the time, but stated recently that he had left the IRA in 1974, two years after the massacre. Membership of the IRA is outlawed in both parts of Ireland. Admissions of membership are rare, and can result in lengthy jail sentences or lead to the imprisonment of others. Mr McGuinness responded that the people of Ireland were “not stupid” and were aware that he had “worked very hard” to bring about the peace process at risk to his own life. “That’s how people judge me out in the country,” he said. As the seven candidates debated the role the president could play in making a better Ireland, Mr McGuinness later said there were many important anniversaries coming up over the next decade for both unionists and nationalists. The historic centenaries include the formation of the Ulster Volunteers, the signing of the Ulster Covenant, the anniversary of the 1916 Rising, the War of Independence, among others. Mr McGuinness said he would like to see “a decade of national reconciliation” beginning in 2012 to recognise the anniversaries. In response to allegations by Fine Gael’s Gay Mitchell during a debate on the Newstalk radio channel, that he earned a six-figure salary as Deputy First Minister and also as Mid-Ulster MP, Mr McGuinness pointed out he is paid the average industrial wage by Sinn Fein, and that the remainder goes to fund the party organisation. He also noted that, as an abstentionist MP at Westminster, he receives no MP salary. Mr McGuinness also made public details of a Bank of Ireland account which he said proved he received an income of 370.38 pounds sterling per week after tax, the average industrial wage in the Six Counties. Mr McGuinness described the various attacks as nothing more than “dirty tricks” from Fine Gael in an attempt to bring some relevancy to their campaign. Mr McGuinness also courted controversy among republicans this week when he agreed that it was legitimate for the term ‘murder’ to be used in some cases where innocent civilians were accidental casualties of the IRA in the conflict. It is a change in the rhetoric employed by Sinn Fein, who have avoided using the word in the past because of its criminal connotations. Former British prime minister Margaret Thatcher famously used the phrase “murder is murder is murder” when refusing to give political status to IRA prisoners in 1980. In an interview with the Independent newspaper, Mr McGuinness said he accepted some IRA actions could be described as murder. “I accept that in the circumstances where innocent people lost their lives, it is quite legitimate for the term murder to be used,” he said. Even the republican ex-prisoners’ group Coiste, which is openly supportive of Sinn Fein, challenged McGuinness’s comments. Michael Culbert, director of Coiste, described it as “legislative language and aggressive language”. “It was the sort of language that was aways used against us.